Honor, the brand of cell phones for Huawei's digital natives, has decided to celebrate the great commercial success of Honor 8 with a series of incredible offers for November 11, 2016: this smartphone is on sale hourly for only 1 pound in vMall. Honor again demonstrates the value of undertaking special initiatives in favor of users. 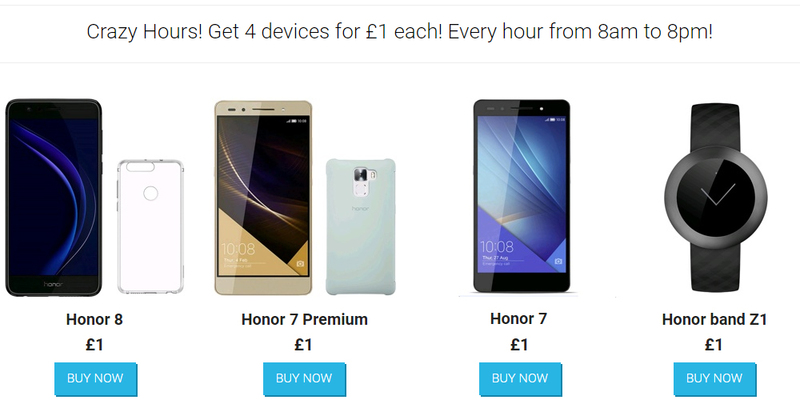 On November 11 from 8:00 a.m. to 8:00 p.m. (local time), some lucky ones can buy for 1 pound one of the most sold Honor products, from Honor 8, to Honor 7 Premium or a SmartBand Honor Z1, all at same price. The winner is the fastest to click and you have all day to try your luck following the timer. VMall is the official online store for Honor's parent brand, Huawei. This is a good initiative that guarantees a good dose of free advertising for the emerging Chinese brand. Honor, therefore, launches an incredible promotion but will only be reserved for the fastest. The suggestion, therefore, is to keep an eye on every new hour to visit the electronic stores of the brand in order not to miss any offer. If you are interested in this proposal, we recommend you to be near your PC and have the credit card ready to take advantage of each offer immediately. The initiative of this promotion, as indicated at the beginning, wants to celebrate the success of Honor 8, an Android smartphone that has been well received since its launch in the market. The Honor 8 has a glass body in which is embedded a screen of 5.2 inches with resolution of high definition. It has a HISILICON chipset with Kirin 950 CPU and octa-core processor (4x 2.3 GHz Cortex-A72 and 4x 1.8 GHz Cortex-A53), with Mali-T880 MP4 GPU made by Huawei, 4 GB RAM and 32 or 64 GB of ROM depending on the choice of variant. Of course, it includes Wi-Fi connections 802.11 a/b/g/n/ac dual band, Wi-Fi Direct, Bluetooth 4.2, A-GPS with GLONASS or BDS, NFC, infrared port and fingerprint recognition sensor. In the image section inherits the best of Huawei P9: 12 megapixel dual-lens rear sensor, f/2.2 focal aperture, laser autofocus, dual LED flash, 1.25-micron wide pixel, full video recording capability HD 1080p at 60 fps (up to 120 fps for slow motion video); 8 megapixels on the front sensor with a focal aperture of f/2.4 and 1.4 micrometers for larger pixels.